Discussion in 'Ad Campaigns' started by Stereo_Flo, Jan 13, 2016. This looks cheap and rushed. Like a last minute decision after Willy left. And the cast is awful as well. Though Sofia looks good. Very much agree with you!! This is easily the cheapest looking Dior campaign ever. It looks so much like an Elle editorial. Older? I thought Roos was like 15, how old is Sofia? As of this past July (when she opened Couture) she was 14. They don't have any creative director so, it's quite good considering that. It's classic, chic and timeless. The models are very random but i believe that they will push the accessories and fragrances campaigns more. Carine is getting all the campaigns (Givenchy, Dior, Chanel, Tom Ford, Max Mara). Good season for her! I think Patrick is a nice option during this transitioning time. But as much as I was bored with Willy´s style for Dior at least it was worthy of discussion, this is so safe it borders on bland and boring imo. Looks like an ad for Saks! Totally lifeless. Boring. Such a sad end for Raf's last collection. The choose of models seems random (even Sofia) they are all blond and boring. It looks like an editorial for the Dior Magazine. I miss vanderperre too. I wasn't expecting anything else when I heard Raf was gone before the campaign was produced but it's still disappointing. ^That's Grace Hartzel?Oh,why?She's so beautiful but I doubt her model skills. SWAN SONG: Raf Simons’ final ready-to-wear collection for Dior is showcased in the French house’s spring 2016 campaign, slated to break on Jan. 19 in Harper’s Bazaar in the U.S. and In Style in Korea, followed by Harper’s Bazaar Japan, Vogue France and Elle China the next day. Outdoor treatments are to debut in Hong Kong on Jan. 23. This story first appeared in the January 15, 2016 issue of WWD. Subscribe Today. Models Sofia Mechetner, Roos Abels, Staz Lindes, Maartje Verhoef, Grace Hartzel and Binx Walton had their windblown hair done by Duffy and low-key makeup applied by Peter Philips. 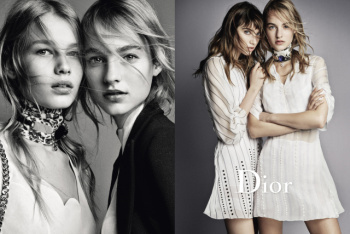 An accompanying digital film is to debut on Dior’s Web sites and social media from Jan. 20. I truly wish that this campaign could be photoed outside the studio with beautiful nature. Because i really like the clothes this season. It soft and romantic but modern at the same time. It should be breath-taking. It's very serious and very corporate. You can defenitly tell the direction of this campaign came from a business viewpoint because there's no fantasy, no artistry, and no warmth. The other member who said it looked like an Elle editorial was dead on. The photos are not bad. They are great Demarchelier portraits. But I feel like with this particular collection and the casting, they could have benefited from outdoor shoot. The cast is insipid. Maartje is such an awful model. The add is nothing special, but i like it. Not a fan of Gracie there but the other models look good. This whole collection was just a plain vehicle for showcasing the shoes, scarves and bags. And Carine did nothing to elevate it... Same looks as in the show. I'm sure she got paid big money for this. I wonder just how much Peter Philips regrets leaving Chanel. I'm sure his transition was largely due to Raf being at Dior. "Hommage to femininity" indeed calls for a group of a 14 year old, a 16 year old and a not particularly mature looking 18 year old who all are the same type of blonde, classic, somewhat "plain" beauty. I can't wait to see how Binx will fit in, to be honest. They look like little kids, would have loved to see grown women in this styling.